Imagine having the one book that none of your competitors ever want you to have. Well, we'd like to give it to you absolutely free. We want to put some of the most profound marketing information in your hands today, and we want to watch your business grow as a result. If you take the time to read and discover the timeless principles found within Scientific Advertising, it will change your approach to advertising, and greatly improve your response rates. We’ve seen it happen over and over again. Discover for yourself why every single member of our team MUST READ this book before ever speaking with a client. 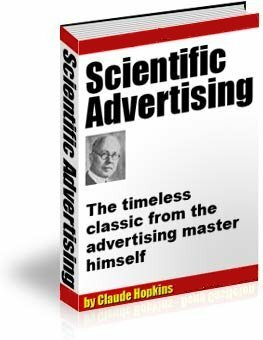 Scientific Advertising contains 21 short chapters of timeless copywriting and marketing strategies. We want you to read this book before you spend any more money on advertising. Despite that fact that it was written almost 90 years ago, it remains the book to read to understand advertising and marketing at its best. At Russell House Marketing we pride ourselves on our well thought out and strategic approach to direct marketing. After 20 years in the business, we've come to learn a thing or two. We believe that when our clients learn from us, great things happen. You can do everything we do yourself. . . but do you really want to make the dumb mistakes that we learned from? Plus, as an added bonus – Learn our very special 10 Rules for Direct Marketing included with a very special message just for you - absolutley free - become a stronger marketer today. Simply fill in the form below and within seconds you'll receive a special email with a link to your free copy of 'Scientific Advertising' and 10 Rules for Direct Marketing that will change the way you talk to your customers forever!